Very clean and quiet. Good price. Will stay again. Where to find Kennewick hotels near an airport? Where can I find hotels in Kennewick that are near tourist attractions? You will find a number of accommodation options to consider when planning your vacation in Kennewick. At the moment, there are approximately 15 accommodations within a 0.1-kilometre (0.06-mile) radius of the center of Kennewick which are in Expedia's large network. The Loyalty Inn Pasco is one of the most convenient accommodation options because it is one of a small number of options within walking distance of the Kennewick downtown area. The Baymont Inn and Suites Tri-Cities/Kennewick WA, Super 8 Kennewick and Kennewick Suites are useful choices for tourists chasing cheaper accommodation. 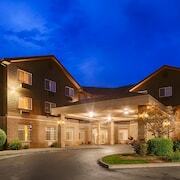 12 kilometres (7 miles) away from downtown Kennewick, is the Towneplace Suites Richland Columbia Point. Alternatively, the Courtyard by Marriott Richland - Columbia Point is situated 12 kilometres (7 miles) away. The Holiday Inn Express Hotel & Suites Pasco-Tri Cities and also the Holiday Inn Express & Suites Richland are two other recommended Expedia-listed accommodations around Kennewick. For those who are inspired to see more of the mountains that are a big feature in this region, you might also book some extra days in other parts of Eastern Washington. You could travel to the region's attractions or enjoy rock climbing and afterwards book a suitable place to stay the night. The closest accommodation options in Tri-Cities are Pasco and Richland. Pasco is 3 kilometres (2 miles) to the northeast of Kennewick, while Richland is 14 kilometres (9 miles) to the northwest. Pasco accommodations are the Best Western Plus Pasco Inn & Suites and Red Lion Hotel Pasco. 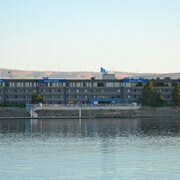 While Richland hotels are the Hampton Inn Richland/Tri-Cities and Red Lion Richland Hanford House. Before you leave Tri-Cities, make sure you catch local game. Visit Toyota Center to the west of Kennewick. Stay close to the action at the Fairfield Inn By Marriott Kennewick or the Best Western Plus Kennewick Inn. Tri-Cities Airport is located 6 kilometres (4 miles) away from Kennewick. Travelers who wish to stay nearby, you can book a room via Expedia at the King City Knights Inn/Pasco WA or Loyalty Inn Pasco. What are the most popular Kennewick hotels? Are there hotels in other cities near Kennewick? 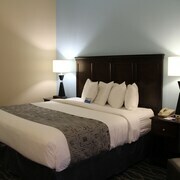 What other types of accommodations are available in Kennewick? Explore Kennewick with Expedia.ca’s Travel Guides to find the best flights, cars, holiday packages and more!